Today kicks off our Technology Services World Conference in Las Vegas at the fabulous Aria. Though the conference offically starts today, I was here yesterday for the Partner Advisory Board meeting. We had a very productive meeting, with a lot of sharing on both sides. I presented the findings of my recent knowledge management survey, and our newest research executive, Judi Platz, gave the partners an advance look at the Customer Success data she is releasing at the conference. Great discussions on industry trends related to knolwedge sharing and corporate culture, the cloud economy and impact on service operations, and defining and measuring customer success. Today I open the conference with the TechBEST Showcase at 12:45, interviewing the finalists for our TechBEST Best in Adoption award. The results are determined by my annual technology survey, and we recognize the three partners who had the largest increase in adoption by TSIA members in 2014 compared to 2013. The finalists are Changepoint, LivePerson, and Verint Systems. For more information, here’s a writeup on the award and finalists. After the opening keynote speeches, the first round of breakouts are the Power Hour sessions, with each of TSIA’s researchers giving a presentation on what is hot in their service discipline or focus area. My session will be revealing the results of my August Knowledge Management survey, and the results of the survey are being published on the TSIA website today as well. The survey showed that companies still see enormous potential for productivity improvements from KM, and there is growing adoption of KM processes across service divisions. I also collected a lot of data on new technologies related to KM, including expertise management, unified search, mobility and video, and crowdsourcing content. And, I have data on KM staffing, approach to content maintenance, as well as very interesting data on corporate KM culture. Stay tuned for a post tomorrow with a few data points from the survey. And for those of you attending the show, send somebody to my presentation today! For those attending the conference, I still have a few 1:1 meetings available on Tuesday. If you’d like to book a 30 minute meeting with me, please ask at the conference registration desk. Thanks to everyone for your support, and I look forward to seeing all of you in the EXPO! Talent management. With companies reporting as much as 40% of their service workforce will be retiring in the next five years, field service has an opportunity to rethink organizational design and processes. Mobility and wearable devices. 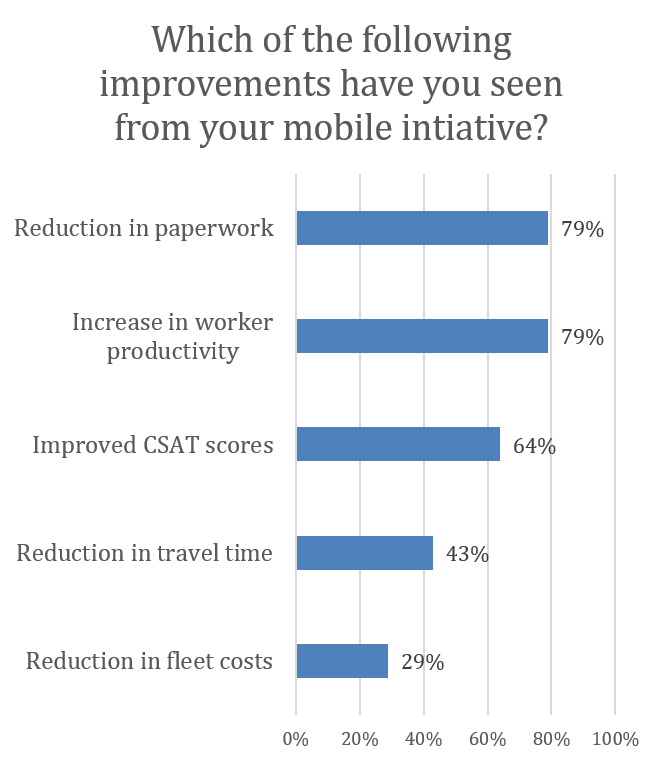 Early adopters of mobile tools and applications for field service technicians are already realizing benefits to productivity, operational quality and cost. Knowledge management and collaboration. Strategies for knowledge sharing and real-time peer collaboration in the field. Internet of Things. Today’s increasingly connected technology creates opportunities for remote access, improving productivity and reducing onsite visits. Expand selling. Leveraging industry trends to introduce upsell/cross-sell strategies, as well as introduce more premium service options. Not only will we share some industry data to explain the impacts of these hot topics, including some brand new TSIA data showing the business impact of mobile tools for field service, but we’ll hear from Debbie how some Astea customers are harnessing these trends to generate business value, from increased productivity and lower fleet costs to increased revenue. Thanks for reading, and hope to see you in the audience tomorrow! TSIA’s 2nd Annual Knowledge Management Survey Is Now Open! I am pleased to announced that TSIA’s 2nd annual Knowledge Management survey is now open! Knowledge management (KM) is one of the most frequent inquiry topics from TSIA members across service disciplines. In fact, 24% of my inquiries over the last year were about KM and self-service, which is pretty impressive considering I cover 24 categories of tools and services in my research. Though adoption of KM tools is very high, most companies are not happy with their existing implementation. In my 2014 Global Technology Survey, KM received an average satisfaction score of 3.6 on a 5 point scale–hardly an endorsement of existing KM tools. 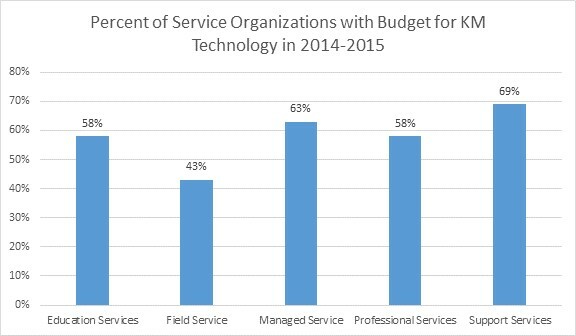 As a result, over half of technology firms have budget for new or additional KM tools in 2014-2015. Thank you for your interest in knowledge management, and for your support of TSIA Research!